You will need to contact the Brazos County Road and Bridge Department for a Development Permit. If your property is located within city limits or city extra territorial jurisdiction (ETJ) you should check with that city. 2. What are the zoning regulations in Brazos County? 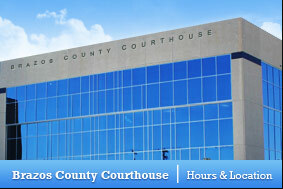 Note our Brazos County Building and Zoning Letter There are no zoning regulations in Brazos County. If you are in a city’s extra territorial jurisdiction (ETJ) you must follow the city’s zoning regulations. 3. How do I get a copy of county development regulations and policies? The Brazos County Subdivision Regulations are available for download from Forms and Documents page. 4. When am I required to plat? See the subdivision regulations document for detailed instructions on when you are required to plat. 5. How do I obtain a Super Heavy or Oversized Permit? Permit fees may be paid with cash or check only. 6. What do I need for a permit for sewage facilities? Contact Brazos County Health Department at (979) 361-4450 to find out exactly what you will need. 7. How do I know if a property is in a floodplain? Email the Floodplain Permit Specialist or call (979) 822-2127. 8. How do I bid on county road work if I am a contractor? Please subscribe to receive invitations for bids by electronic mail or see the vendor information from the Purchasing Department. 9. Who do I call about litter on the road? If a county maintained road has litter or someone has dumped trash on the side of a road, please give us a call at (979) 822-2127 and we will have it picked up. We will also try to find out who dumped the trash on a county maintained road or on the side of the road, and legal action may be taken. 10. How do I get a county road mowed? Contact the Road and Bridge Department at (979) 822-2127 to request roadside mowing of a county maintained road. 11. How do I get my subdivision maintained by the county? See subdivision regulations to find out if and how this is possible. 12. What do I need for a permit for sewage facilities? Contact the Brazos County Health Department at (979) 361-4450 to find out what you need. 13. How do I get specialty sign installed on a road? For signs other than normal regulatory traffic signs, you will need to send a request to our department stating your reasons / justification for needing the sign. The Road Administrator will then approve or disapprove this request. If your request is approved you will need to then purchase the sign yourself and the road department will install the sign if on a county maintained road. Please send your request to Road Administrator. 14. How do I get a new address for my house? You will need to contact 9-1-1 Addressing at (979) 779-0911. 15. What rules does the county have about mail boxes? 16. Who do I call about dead animals on the road? If you notice a dead animal in the right of way of a county maintained road, please call us at (979) 822-2127, and we will get it taken care of as soon as possible. We do not have the means to pick up large livestock. We cannot go onto personal / private property. 17. How are street names and markers assigned? Reference the subdivision regulations to learn how street names and markers are assigned. 18. Who plans new roads? 19. How do I get a culvert installed for my driveway? 20. How can I find out if a road is maintained by the county? If the road is a farm / ranch to market road, is in the city limits of an incorporated city, or is a private road, the county does not maintain it. To find out, call Brazos County Road & Bridge Department at (979) 822-2127. 21. Who do I contact about road repair or maintenance? Call the Road and Bridge Department at (979) 822-2127 to report problems or submit a work order request. 22. How does Brazos County determine the speed limit on a county maintained road? Reference the Brazos County Speed Limit Determination document for detailed information.